Exclusive hilltop property in Escazu for sale: Probably one of the most spectacular properties throughout Costa Rica. This wonderful piece of real estate is ideal for a large hotel and luxury residences. Multilevel terraces provide ideal location for commercial or residential development. The property also has public road access of 500 meters. The center of Escazu, a fashionable suburb of San Jose, just 5 minutes, the airport is about 30 min. The development capacity is represent 15% from the total area (5,475 square meters and 3 platforms). It can be 7 Independent houses, 135 apartments or Hotel. 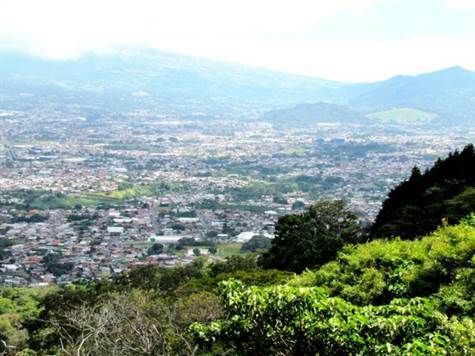 Panorama scenic of the entire Central Valley: From San Ramon over San Jose to Cartago, as well as the volcanoes of Irazu, Poas and Barva. Sweeping views of the central valley and mountains makes this property an unmatched development opportunity! $100 per square meter!